Simply keeping your roof in good repair and maintaining a good quality paint coating can improve the lifespan of your roof for years. If you let rust get a hold, even a sturdy roof will be undermined to the point of no return in a short time. As a roof reaches the end of it's serviceable life, it's essential to make sure that leaks don't undermine the ceilings, internal walls and structural integrity of the house. Should your roof be beyond repair, reroofing sooner rather than later can save thousands of dollars of damage that could have been avoided. 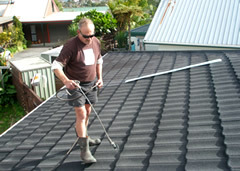 Don't let a roofing problem be an ongoing worry when we can give you a free roof consultation. 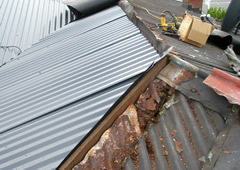 John Duff Roofing offer a range of options for Decragard Roof Coating for old Concrete Tiles, Metal Tiles, Corrugated Iron. If your roof is aging but still in good structural condition, recoating it will increase it's life span and save you money. 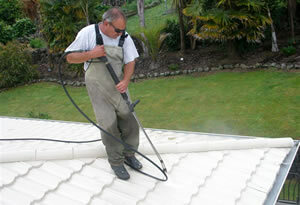 Chemically cleaning your roof protects the most important asset you have. Removing lichen and moss prevents leaks, dampness and mould growth and slows the aging process of your roof. Moss and lichen damages roofs by excreting acid, blocks water channels, cracks tiles and breaks down mortar.